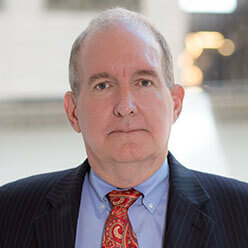 Partner Tom Robertson is deeply experienced in many facets of land use and environmental litigation, having served as an attorney with the Miami-Dade County Attorney’s office for 30 years. While there, he practiced in the areas of Environmental Law, Zoning, Real Estate Finance and Liens, Personal Injury, Contracts, and general governmental law. In each of these areas, he was active in litigation including many jury and non-jury trials. He was the general counsel to the Solid Waste Department, Department of Environmental Resources Management and Vizcaya Museum and Gardens. He was the Section Chief for the Environmental and Zoning Enforcement Section at the County Attorney’s Office. He handled cases in both the Federal and State Courts and also handled appeals in both the Federal and State appellate courts, including cases in the Florida Supreme Court. Tom is an AV Preeminent 5.0 out of 5-rated attorney by Martindale & Hubbell and is a member of the American Board of Trial Advocates. He received his Juris Doctor, with Honors, in 1980 from the University of Miami School of Law, and his MBA, also from the University of Miami, in 1979. He has an undergraduate degree in Industrial Management from Georgia Institute of Technology. Tom has been active in the Boy Scouts of America since the early 1980s as an adult leader and has been a Scoutmaster, Assistant Scoutmaster and Chartered Organization Representative. Tom received the Silver Beaver Award for outstanding leadership to the local council as well as the St. George Award for service to his church and scouting.